‘Pent’ is a term used to describe a flat roof or a sloping flat roof. Dependant on the design of the building, the roof could slope front to back, back to front or side to side. If you require your roof to be situated a particular way, please contact our sales team for more advice or to enquire for a bespoke quote for you. 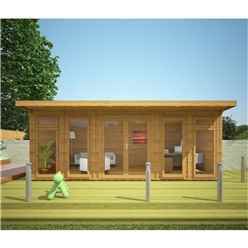 Many of our Pent log cabins consist of a large storage/inside area and also an outside area which is sheltered. 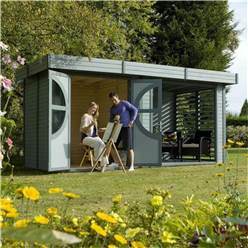 This could be perfect for you if you require a storage area and a pleasant outdoor place to add quirky tables and chairs on the outside, due to the shelter, you could sit and enjoy your garden whatever the weather. You could even turn the outside area into a BBQ area. You can never fully rely on our great British weather so what better way to keep your BBQ feast dry! Other of the Pent cabins consist of two separate storage rooms. This could be just what you have been looking for. One side for bikes possibly, the other could be made into a general storage room or a cosy seating area. Maybe you could create half of your cabin as a side for the children, and a side for the adults. The possibilities are endless. 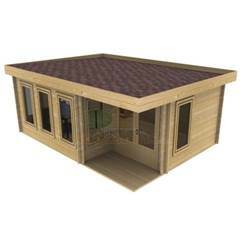 The Connor Pent Log Cabin is a real eye catcher due to its round feature window in the double doors. 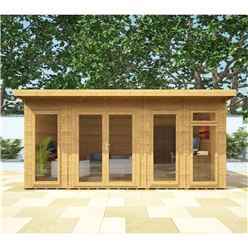 The other half of the cabin is an outside area with a back and side wall creating a beautiful shaded and sheltered area for those chillier evenings or those super-hot days when you require some shade. By adding a table and some comfortable chairs, what better way to end your day. If you are looking for a Pent cabin that is just one whole room, we have many of these available too. These are available in a number of different styles, such as, a completely flat roof or a slightly sloping roof. A choice of where you require the double doors to be situated. Floor length windows, at the front, each side, or both as well as the option of single glazing or double glazing. Interlocking corners, which look great and add extra structure to the building. Some cabins are available with large overhangs over the front of the building to create a shaded area outside the cabin, or even some shelter for those drizzly mornings. Most of our Pent cabins are available with a choice of single glazing or double glazing for the windows and doors. Also available, is the choice of the wall thickness you require, this is usually dependant on what you intend to use the building for. All of our cabins include the full fixing kit which includes the nails and screws you will need to carry out the install of you cabin, we will include the full instruction manual and the roofing felt is also included for free with most of our cabins. If you have any queries regarding any of this information, please contact a member of our sales team who will be happy to help. When looking for the perfect log cabin, roof design is probably not top of your list of priorities. Rather, you are more likely to be concerned about the size and overall look of the cabin, not to mention whether or not there is something to suit your budget. But roof design is important, because it makes a big difference to how a log cabin looks and functions, so if you would like to know more about pent roofs, read on for some useful advice. What is a Pent Roof? A pent roof is essentially a flat roof. It may be flat, or it may slope down to one side. Smaller pent roof sheds typically have the highest point of the roof above the door, with the roof dropping to the back of the shed. In a shed, this design works well, because you have plenty of headroom at the front of the shed where the door is, and less room at the back where items are stored. In a log cabin, a pent roof can slope any which way: from back to front, side to side, or even multiple ways in the case of an octagonal log cabin. Some log cabins even have a flat roof, although this is less desirable as there is a greater likelihood that water will pool on the top and cause problems. If none of these designs quite fit your notion of the perfect log cabin, we can even come up with a bespoke pent roof log cabin just for you. 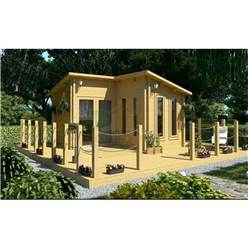 Compared to traditional apex log cabins, pent log cabins are a more modern looking design. Many of our pent log cabins have an indoor room with a covered outdoor area. So if you purchase a log cabin with a view to turning it into a summer house, you can create a cosy living space indoors, together with some comfortable seats, a table and perhaps a couple of shelves, and then enjoy a nice covered seating area outside as well. With a pent cabin, you get the best of both worlds: an indoor room and a sheltered outdoor space from where you can enjoy your garden without being troubled by the rain. The sheltered porch is also a great place to have your BBQ, especially if rain is forecast. After all, it’s not much fun cooking in the pouring rain. Another fun idea is to install a hot tub on the deck: you can invite your friends round, crack open some beers, and get the party started! During the winter months, your log cabin doesn’t have to remain cold and empty. Instead it can be transformed into a cosy living room, complete with a log burning stove if required. As long as you select a pent log cabin with thick enough tongue and groove walls and a well insulated roof, you will stay warm and snug even on the coldest days. Pent log cabins are especially useful when it comes to storage. If you invest in a large pent log cabin with double doors on the front, you have plenty of access to wheel in your collection of bikes and garden machinery. Larger log cabins can even be split into two rooms, with one room used for storage and the other as an extra living space. 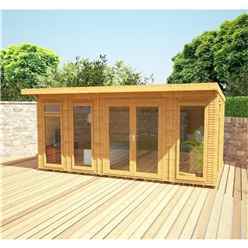 This, combined with an outdoor covered decking area, means a pent log cabin is eminently flexible. 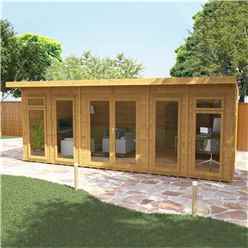 If you are looking for a home office, a pent log cabin is a good choice. Some of our larger log cabins make perfect home offices, and with thick tongue and groove log walls, you’ll be warm as toast all year round. Because natural light is very important when you are working all day long, choose a log cabin with plenty of windows. This will ensure you have lots of light and ventilation. Natural light is also important if you plan on using your log cabin as an outdoor art studio. Log cabins make great art studios because they are away from the main home, which means you can enjoy plenty of peace and quiet to explore your creative urges. With so many pent log cabins to choose from, it can be difficult to select the right one. Since budget is likely to be a major factor in the decision making process, think carefully about how you intend to use your log cabin. The more time you anticipate spending in the log cabin, the thicker the walls need to be. Log cabins with thinner walls are no good for use during winter, as there is not enough insulation to keep the cold out. 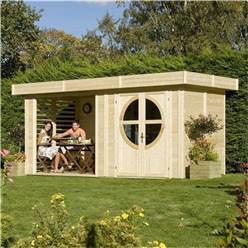 You should also check whether you need planning permission before you install a large log cabin in the garden. If you need any more information on choosing or installing log cabins, call us for a no obligation chat – our customer support team is always on hand to offer free advice.